I can eat so many of these in one sitting, there that delicious! 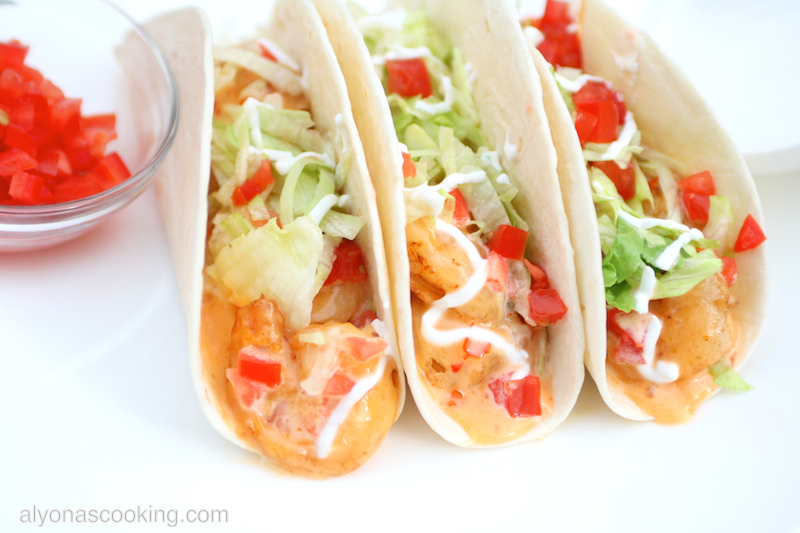 They have the perfect hint of spiciness and yet are slightly sweet, which just creates a perfectly balanced sweet & spicy sauce. Of coarse you can adjust the heat to your liking but the amount called for is perfect, it’s not too hot and not too mild. 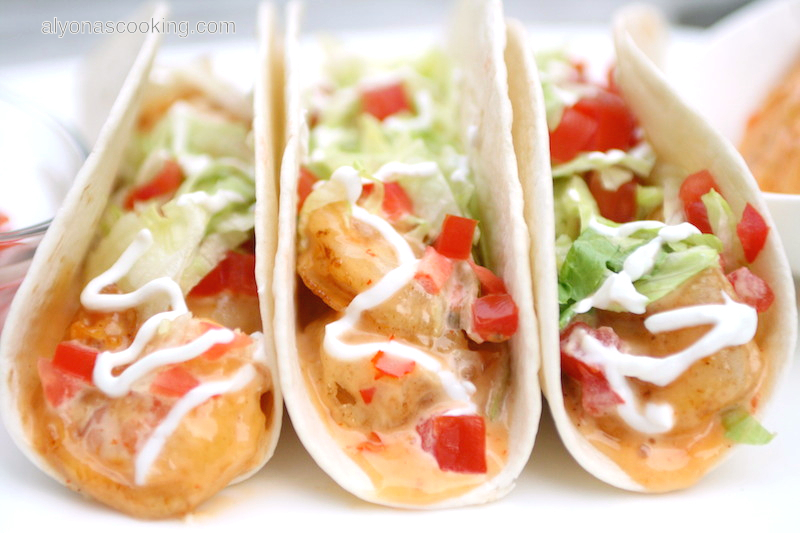 So you may want to double up on that sauce (it’s really that good!) Serve warm or even cold (they happen to be super tasty cold too) and enjoy! 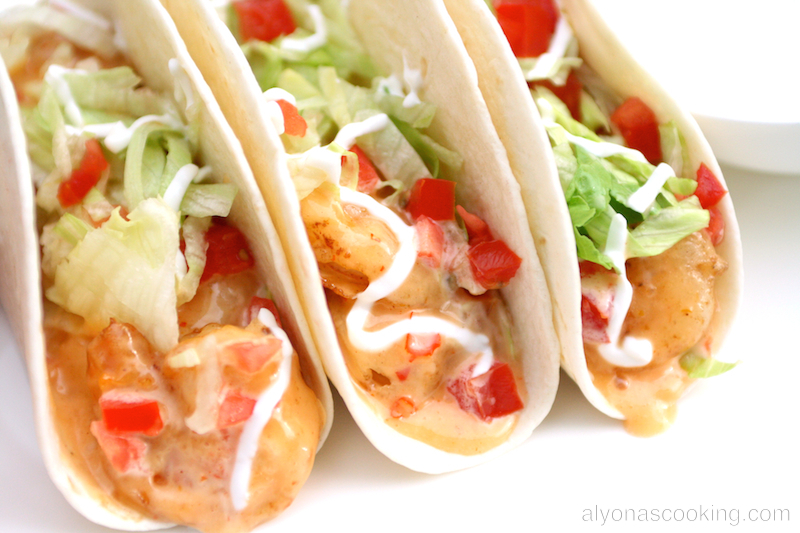 Comment and rate this recipe below I would love to hear your feedback! 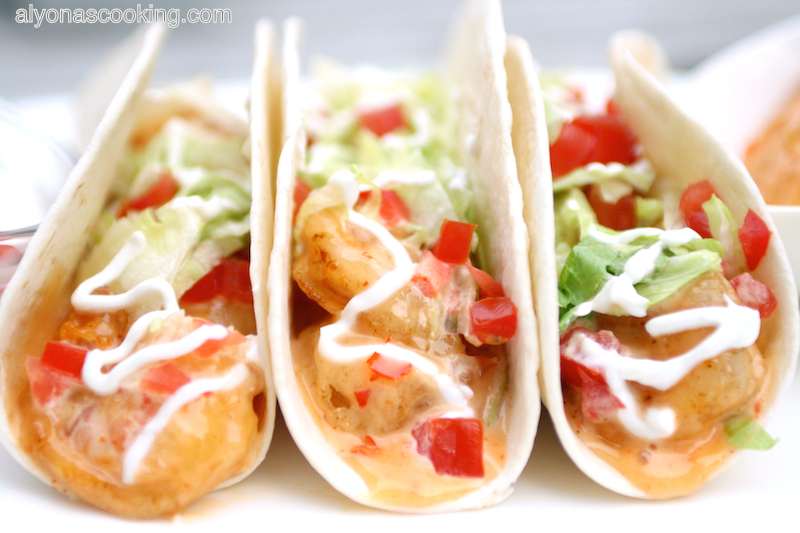 Rinse and pat dry thawed shrimp. 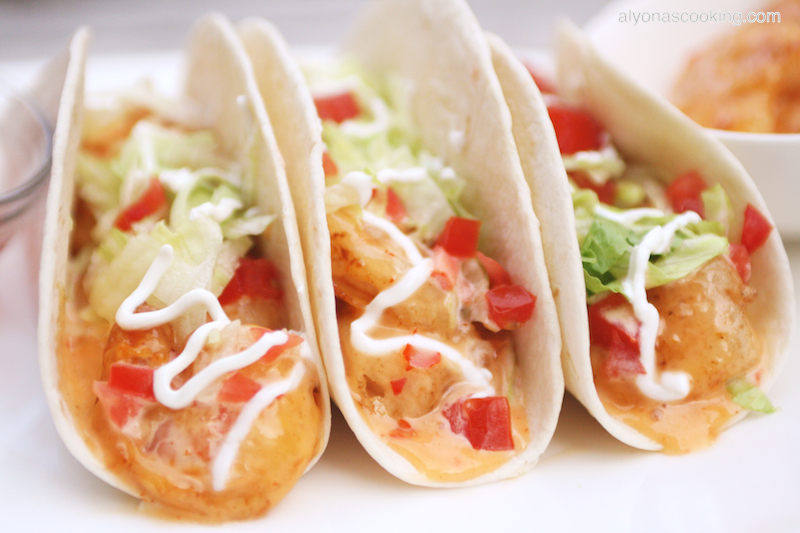 Remove the tails from the shrimp. 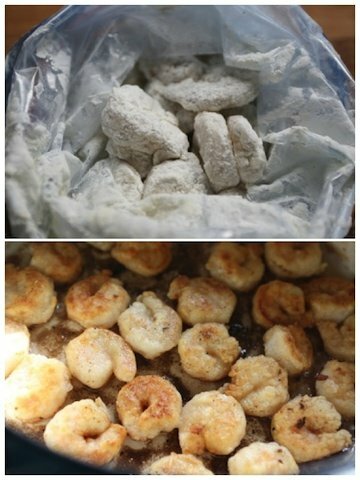 In a large ziploc bag combine the flour, cornstarch and salt; set aside. Pour 1/3 cup of buttermilk into a shallow bowl. 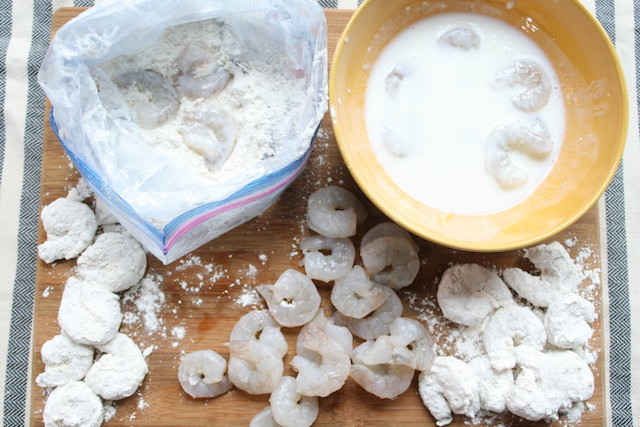 Dip the shrimp into the buttermilk, then throw into the floured ziploc bag and close; shake to coat shrimp evenly. Heat 1/3 cup of oil in a deep skillet over med-high heat and fry shrimp in batches a few minutes on each side until crispy. Shrimp cook very fast so like a minute on each side. Remove and place on paper towels. 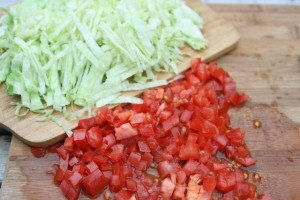 Finely dice the tomatoes and then finely shred the lettuce; set aside. 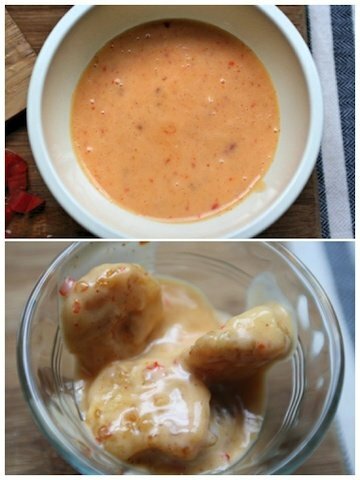 To make the sauce combine the mayonnaise, sweet chili sauce and sriracha hot sauce. Stir well to combine. 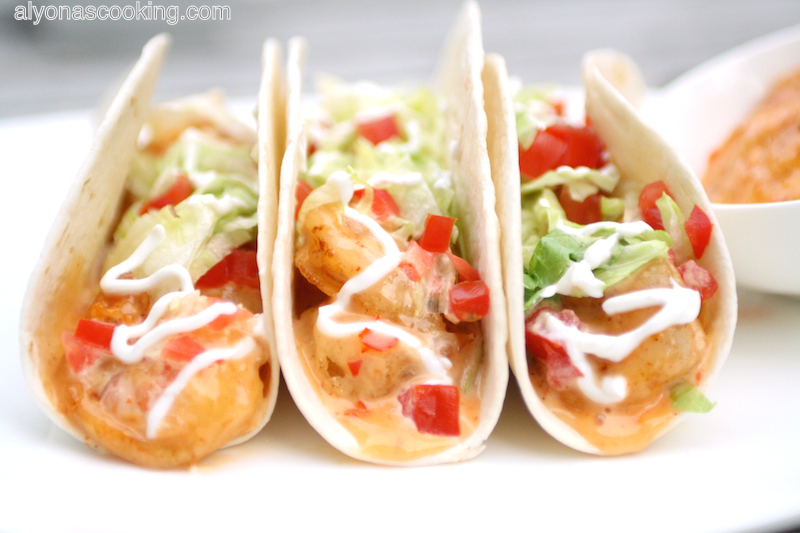 Add the breaded cooked shrimp to the sauce and toss to coat well. 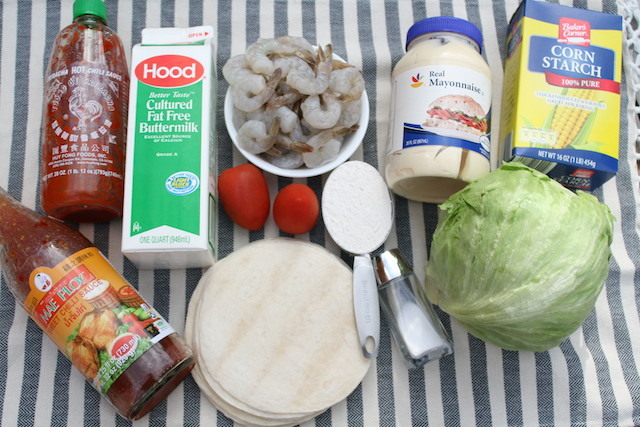 To assemble the tacos place the shrimp (about 4) in the center of each small flour tortilla and then top with lettuce, tomatoes and drizzle sour cream over the top, (I used a small ziploc bag for that). Serve. 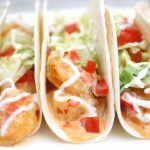 These Shrimp Tacos are easy to make; breaded plump shrimps are tossed in a sweet & spicy sauce and then stuffed into soft flour tortillas along with some lettuce, tomatoes and some drizzled sour cream to top everything off. Great dish, It looks very tasty! Thank you for the many kind words, Olha! Im so glad to hear you like a lot of my recipes! May God bless your family as well!